Building and Pest Inspections locate timber decay fungi (Wood Rot) and water damage in the roof void. Timber will rot if it is consistently wet over a period of time, even the smallest of leaks will cause damage. Regular inspections will identify these issues that will reduce the damage, saving the homeowner plenty. 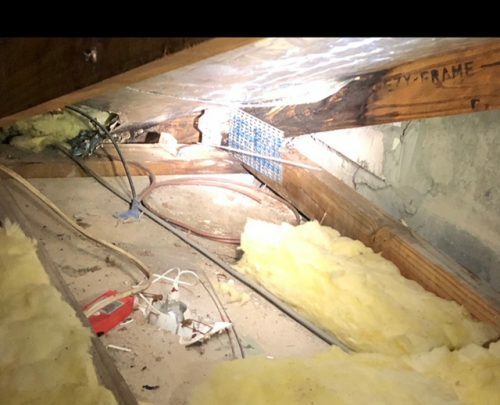 ‭Not everyone makes an effort to check their roof void, but getting a termite inspection by a reputable company that will inspect the available roof space will reduce the amount of water damage that can occur if found early. The best time to inspect a roof void is during the heavy rain, you’ll be surprised what you may find. Water and moisture will attract termites so ensure you rectify any drainage or water leaks at the property, including diverting all hot water and air conditioning overflows that are released against exterior walls, to a drain. Timber Decay Fungi (Wood rot) is part of a termite inspection and a pre-purchase timber pest inspection, as it is considered a timber pest.